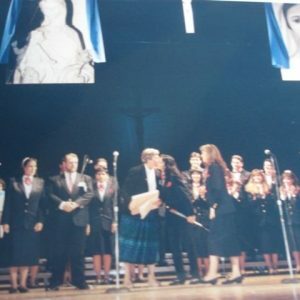 It was on April 24 in 1993 when Mrs. Maria Esperanza Medrano de Bianchini started a beautiful task of evangelization abroad. She had been invited to the United States of America for her first international public presentation to share the message that Our Lady had given her, Our Lady, Mary, Virgin and Mother Reconciler of all People and Nations. Sister Margaret Sims was the first person to take this initiative. 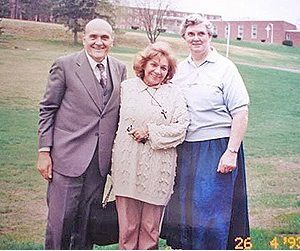 She is a religious from Saint Joseph of the Archdioceses of Boston, member of the former Medugorje Messengers now Marian Community, and founder of Betania II in Massachusetts, USA. Once the Bishop granted permission to the messenger of Our Lady of Betania, Mrs. Maria Esperanza, the hand of God could constantly be seen in so many details that were filling the atmosphere with his divine providence. The invitation was for a spiritual retreat during the weekend. Be Reconciled would be the name for such a retreat and it would take place in Lowell’s Memorial Auditorium. Renowned speakers were invited: Father Slavko Barbaric from Medugorje, Sister Janja Boras, Mr. Wayne Weible and Mrs. Maria Esperanza form Venezuela. For Mrs. Maria Esperanza, her family and members of the Betania Foundation the entrance to the theater would be an unforgettable experience because the attendance was at its maximum capacity, and because of the emotional standing ovation. Among the activities that had been planned, beside the speeches, the retreat included the prayer of the holy Rosary, the chaplet of the Divine Mercy, other prayers, and the celebration of the Holy Mass concelebrated by 22 priests including His Excellency, the Bishop of Boston. Due to the fact that the principal of the Betania Choir, Mrs. Maria Auxiliadora Bianchini de Leon and other members were there as well, they were invited to participate with their songs in several occasions. Mrs. Maria Esperanza gave two wonderful speeches during the retreat. Afterwards people told her that the issues she mentioned touched their conscience and their heart. Among other ideas, she stated that all the people in North America sang to Our Lady waiting at the portal of the temple for the gates to open so all could enter to adore their Lord. She also called for everyone to prepare themselves because difficult times were coming and it was necessary to completely convert so divided brothers could feel the divine breath of Jesus, Mary and the Holy Spirit blowing over each one. Both of her speeches concluded with her humble maternal blessing. 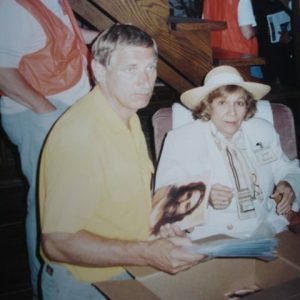 When Mrs. Maria Esperanza would go from the auditorium to the hotel, hundreds of people would approach her telling her about their needs, asking for an autograph and many, even from their vehicles, would thank her for coming and would tell her how much they loved her. Our Lady touched many souls in this way and through her intercession many miracles regarding conversions and healings occurred. One of the most dazzling miracles was granted to Ryan Hulick who was born with spina bifida. 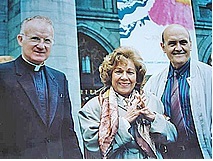 Three months later, Mrs. Maria Esperanza accepted the invitation of Father Heffernan to go to Canada, with the Bishop, Monsignor Lacey’s approval. 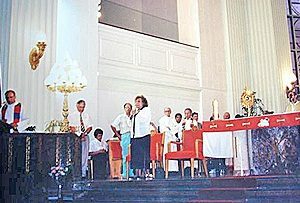 It all began on July 19, 1993 in Toronto with a press conference at the Queen of Peace Center, where Mrs. Maria Esperanza spoke about different issues, especially about forgiveness. The following days, she was invited to Holy Mass in several Churches and afterwards the Bishop and Father Heffernan would invite her to the altar to speak to the parishioners. This was the reason why so many people crowded together to hear her and would later speak to her personally. As in Massachusetts, for this trip there was a small representation of the Betania Choir that was encouraged by Father Heffernan, who is very fond of music, to participate with their songs during the liturgical acts. Later and elsewhere, the above mentioned Bishop, Monsignor Lacey was to be touched by Jesus and Mary in a special way through Mrs. Maria Esperanza, who told him that he would be healed from the lung cancer he was suffering. Choir participated and Mrs. Maria Esperanza was invited to share a beautiful message with everyone. On the next day, a very interesting article was published in Le Journal de Montreal, referring to the visit the messenger of Our Lady was making to their country. The last day, the invitation to Holy Mass was to the Church of the Sacred Heart. Once it had ended, Mrs. Maria Esperanza gave a beautiful talk to the people, and at the moment in which she gave her customary maternal blessing, several people fell to the ground. And, just like this year began, it ended with another beautiful spiritual retreat in Lowell, Massachusetts in the United States of America. This was how another beautiful mission in another country concluded. September was to be the month crowned with the two evangelizing missions that would conclude her international pilgrimage in 1993. The first one was in Pennsylvania, Evans City, because Mr. Thomas Rutkosky had organized with the members of Gospa Missions a retreat called: A day of healing with Maria Esperanza. This day of healing took place on September 4 on Mr. Rutkosky’s farm. On the site, Mrs. Maria Esperanza had an interview with the Bishop, Monsignor Donald Wuerl. Then, the procession of the Blessed Sacrament of the Altar occurred, followed by the celebration of the Holy Mass by Father Ken Oldenski. Afterwards, the members of the Bianchini-Medrano family who were there were introduced,and Mrs. Maria Esperanza was invited to give her first speech, a speech that was filled with love and council. Afterwards, everyone had lunch and then visited the Stations of the Cross concluding with: A testimony of Mr. Jesus Leon, the participation of the small Choir, and as a gift for the children, Mrs. Maria Esperanza gave a final speech. The next day, Mr. Carlos Marrero and Mr. Jesus Leon, sons-in-law of Mrs. Maria Esperanza were invited to a special program on the radio to share their experiences in Betania and their close relationship with her. And, just like this year began, it ended with another beautiful spiritual retreat in Lowell, Massachusetts in the United States of America. 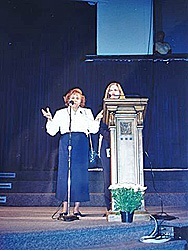 Again, Sister Margaret Sims as a representative of Medjugorje Messengers sponsored it. This time, a great number of the members of the Betania Choir were invited to give a concert to the audience during the retreat: A Retreat Experience: Betania, Venezuela. The opening event took place on September 17 with the celebration of the Holy Mass and with an hour of adoration in the Church of Saint Joseph the Worker, presided by Father Timothy Deeter. Earlier, they visited Betania II to see for the last time, before demolished, the green house that had turned into the point of reference to acknowledge the land destined by Divine Providence for Sister Margaret’s work, just as Mrs. Maria Esperanza had indicated. Both Saturday and Sunday were days of prayer; Holy Mass; songs; decorations; a display of pictures capturing beautiful episodes of Mrs. Maria Esperanza’s life, which were described by Mr. Carlos Marrero and by Mrs. Aida de Perez; and beautiful words from personalities, such as: Father Edward McDonough, Father Timothy Deeter, Mr. Michael Brown, Sister Margaret Sims, Mrs. Maria Esperanza (speech), and Mr. Geo Bianchini and all the children of the Bianchini-Medrano family. 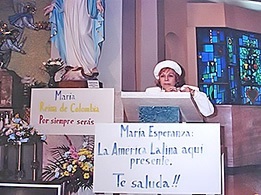 Considering that the Eucharist was pivotal in the spiritual life of Mrs. Maria Esperanza, she was invited to Long Island, New York. It was at Saint Paul’s Shrine where she was nourished with the heavenly banquet, and where she addressed the faithful with words of love and consolation. This was how an unforgettable year came to an end, unforgettable in so many ways. It was a year in which the new ambassadors of the Blessed Mother conquered so many souls for God through love or maybe only by “smiling”.